"It seems that Americans have concluded that in a country like Iraq, there's little hope that a few short years is enough to implement the democratic project. … U.S. military leaders find appeal in the idea of having a general carry out a bloodless coup like those that have occurred in Pakistan, with the promise of peaceful elections and a return to democracy sometime down the road." I'm not sure why, but every time we hit a bottle neck with the Americans, the coup after Iraq was occupied by the British in 1936 is conjured up in my mind. It seems that Americans have concluded that in a country like Iraq, there's little hope that a few short years is enough to implement the democratic project. Meanwhile, surrounding countries and others in the Arab and Islamic world appear to expect a coup d'état. After having watched the outcome of the March 2010 elections, the struggle of the parties for power and the way no one won an absolute majority, perhaps the Americans have begun to question the basis of the political equation and think it wiser to postpone plans for democracy. Another solution would be to hand over authority to the military. There are several reasons that the U.S. might try this strategy. First, American military leaders find appeal in the idea of having a general carry out a bloodless coup d'état like those that have occurred in Pakistan, with the promise of peaceful elections and a return to democracy sometime down the road. Secondly, the American military establishment wishes to avoid direct confrontations with the remnants of al-Qaida and other terrorist and armed groups, as its wider interests in the region depend of preparing the ground for a possible confrontation with Iran. Third, the Americans assume that a general who executes the military coup d'état will be extremely obedient and execute the decisions of the American administration. The fourth reason America might go this route is that a coup would allow the U.S. military machine to remain in Iraq for a long time to come, securing Washington a launching pad for its operations in the Middle East. Finally, the situation is increasingly dangerous. 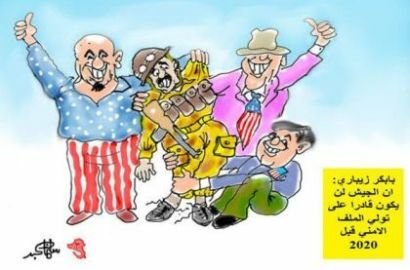 Iraqi politicians, who are pitting their own selfish interests against the political process, must take responsibility. Despite the fact that everything I've discussed are assumptions and speculation, this scenario must be taken into account. Knowing what happens in the halls of power, it's hard to be optimist about current events. Unless we change the people involved and the way they operate, there is little hope that things can be resolved through the current negotiations. Ladies and gentlemen, the solution is here in Iraq - not in neighboring countries.